Not everyone believes in ghosts, but those who do often place great power in the notion of someone they have lost coming to visit them. In film and television, celestial entities returning is usually presented in the context of horror, either misunderstood or trying deliberately to scare those who are still alive. There are rarer depictions that take a more exploratory, peaceful direction, examining unexplained phenomena for those who are in mourning and wondering whether what they have been experiencing is someone they miss dearly trying to communicate with them. Shelia (Marin Ireland raises her son Owen (Josh Wiggins) on her own, monitoring his relationship with his friend Lucy (Atheena Frizzell).) She works by day at an airport rental car agency, spending her free time investigating the presence of ghosts after being apparently gifted with prophetic dreams as a child. 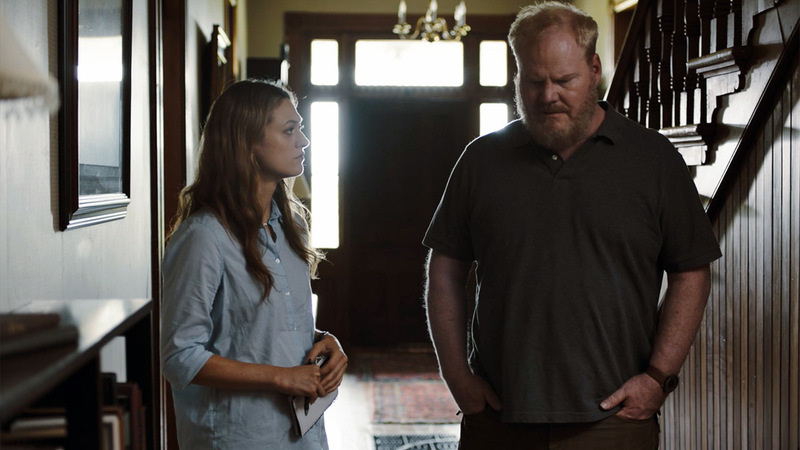 Though she is not officially on any case, she is contacted by a recently widowed man, Richard (Jim Gaffigan), who has been haunted by flickering lights and moved objects in his home. Eager to help him, Shelia begins her surveillance operation to determine whether it is in fact his dead wife who is trying to contact him. This isn’t the kind of film that finds ghosts jumping out and startling the audience, much to the relief of this reviewer with an aversion to horror. Instead, it is an intimate and human drama that purposely stays grounded in the proven real, all while trying to reach a far less logic-based plane. It is reminiscent of “The Eclipse,” another film that found a wounded protagonist searching for his deceased spouse, and considerably more effective overall than the similarly-themed “Personal Shopper.” Richard doesn’t know whether he believes in ghosts, and Shelia never tries to convince him of anything she can’t prove. Ireland is a wonderful actress who has been stealing scenes on “Sneaky Pete,” and it’s great to see her given a lead role like this, making Shelia feel authentic and human. Gaffigan succeeds in an atypically dramatic turn, presenting Richard as a person who has lost all direction and purpose in his life now that he is only living for himself. Wiggins, who has premiered nearly half of the eight films he has made at Sundance following “Hellion” and “Walking Out,” continues on a great trajectory, as does Frizzell, who appeared in last year’s “Never Goin’ Back.” This film is simple and poignant, smartly aware that effects and tricks are far less effective than a solid and involving story and presentation.